i am having an alignment issue with thread link boxes that get inserted with a linked topic. I have no extra components currently loaded in this view. as a fix. It does remove the background for the links below replies, but I couldn’t find a more elegant way to do it. You might also want to change the colours of the links if you find them hard to read with no background. 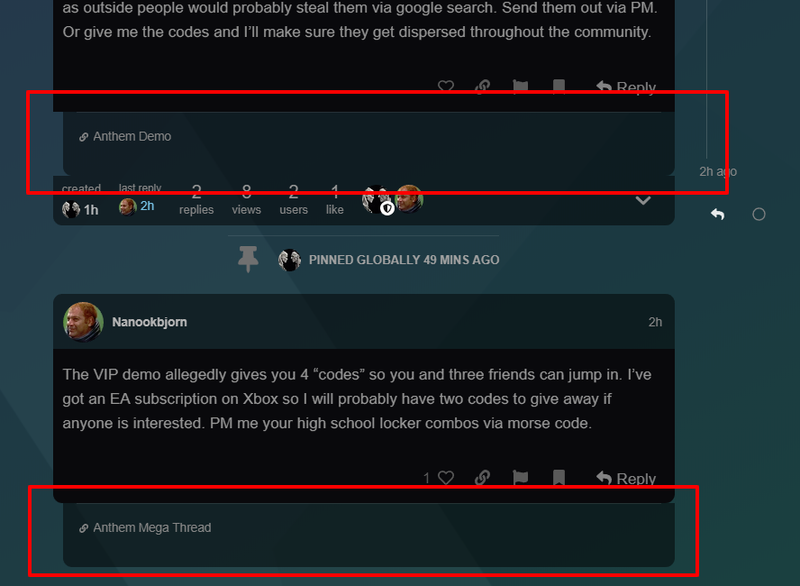 to make rounded borders on the “this post was flagged by…” bit. And a button is missing. I really like this template, is there a way to fix those at this moment? Anyone having issues with Mobile Chrome and this theme? The issue I’m seeing is the hamburger menu as well as the use menu and in my case private messages(have a plugin installed for direct messages) popover menus aren’t working right. The hamburger and the user menus just grey out the site and no menu ever shows. This works perfectly fine in mobile safari. It also works fine in chrome on a desktop emulating mobile. I’m up to date as of right now on the theme as well as I’ve just updated to the latest for Discourse. Anyone else seen this and know of a fix? Another theme I have on the site seems to work fine. Perhaps it’s a conflict with another theme component or plugin? Which ones do you have installed on your site? Can you try running safemode?